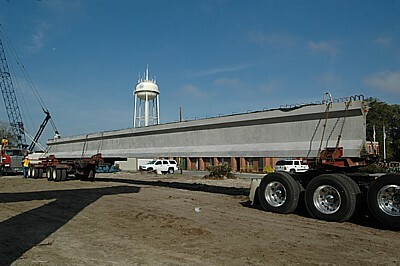 January 6, 2009: A truck bearing a huge girder backs in on the mainland side. 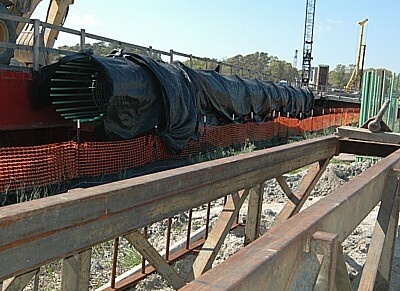 February 1, 2009: A 6-foot-wide drill shaft near the causeway. 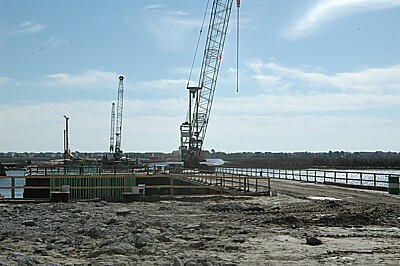 The Big Narrows seen from the island portion of the work bridge. 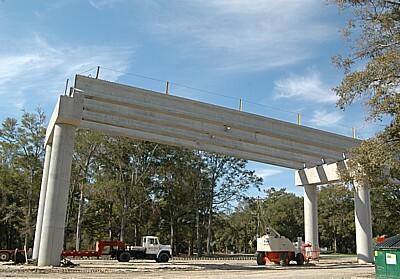 These photos show the mainland girders stretching across the road to the mainland end bent of the bridge where the approach ramp will end. 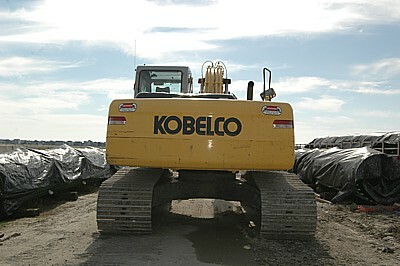 While this might not interest others, I am impressed with the array of equipment and its enormity. 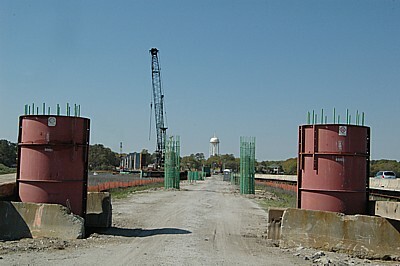 Additionally, I am astonished at the number of places at which bridge construction is occurring. 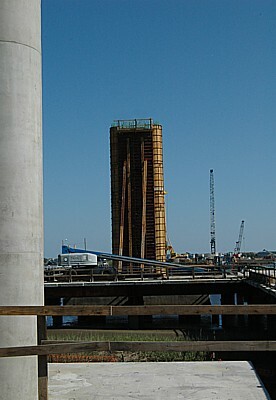 Mainland portion of the work bridge. 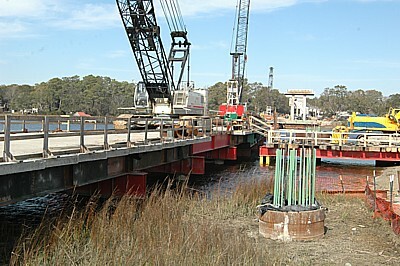 The equipment in the background is at the island portion of the work bridge. 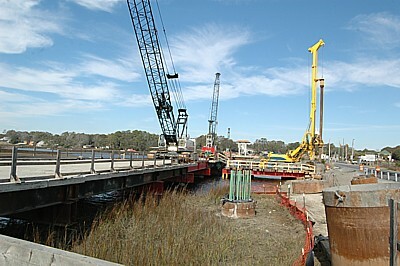 All work in the waterway had to cease by April 1, 2009 and cannot be resumed until September, 2009. 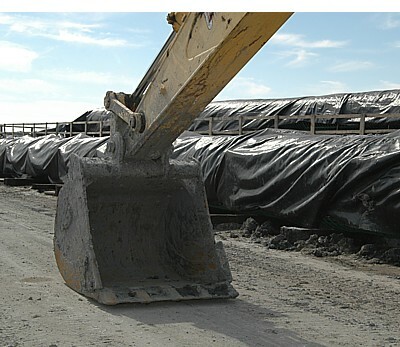 This is because of the critical spawning seasons and the migration of fish. 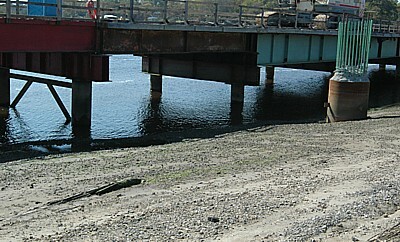 Vibrations from working on the bridge in the water would affect fish -- and surely countless other species of animals such as crustaceans. 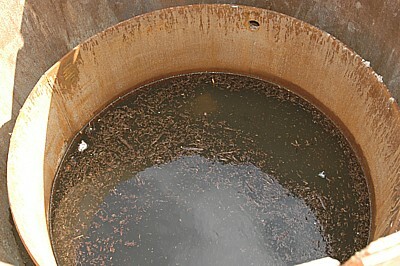 Spring and Summer are the times of the year when most wildlife are born and develop. 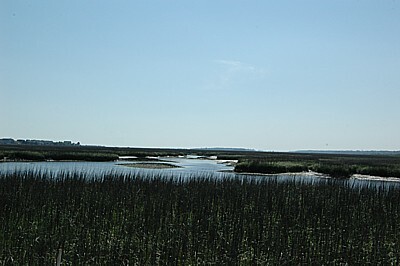 Water temperature during that time period leads to both spawning and migration. 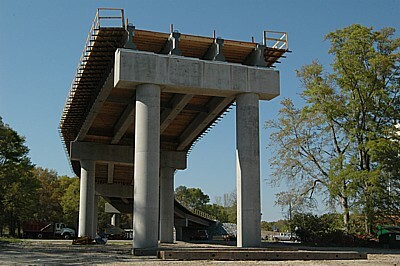 April 12, 2009: The path of the new bridge, its sides indicated by concrete and steel columns curing or drying in red column forms at this end and more rebars in the distance. 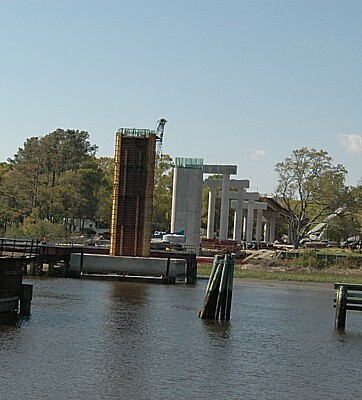 The height of these columns indicates how low the bridge will be on the island side where it meets the causeway. 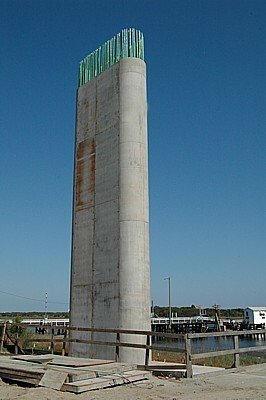 The high portions of the bridge are on the mainland and at the 65-foot high portion crossing the Intracoastal Waterway. 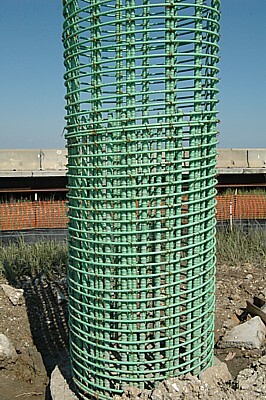 Steel rebars. 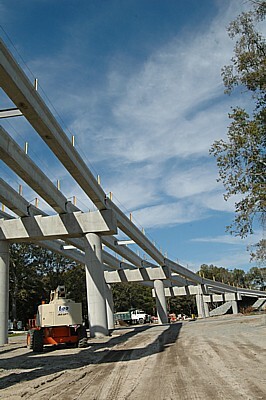 They will be wrapped in red column molds like the ones to the left of this photo. 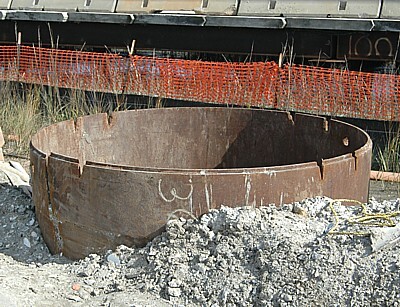 After concrete is poured into them and dries, the column molds will be removed. 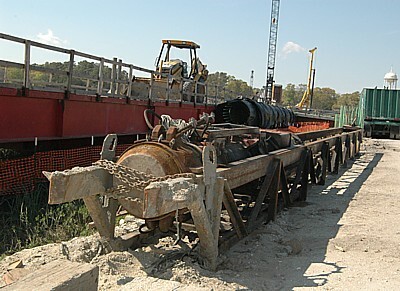 An auger used to drill down into the shafts to remove dirt in order for first slurry and later rebars and concrete to replace the dirt. 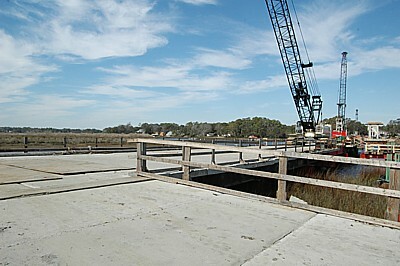 Half of the island portion of the work bridge. The other half of the island portion was behind me. 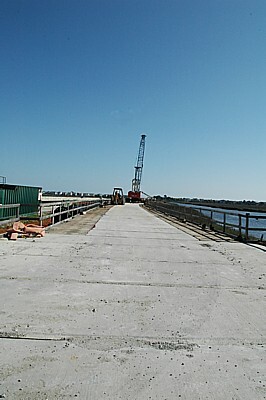 A separate workbridge juts out from the mainland. 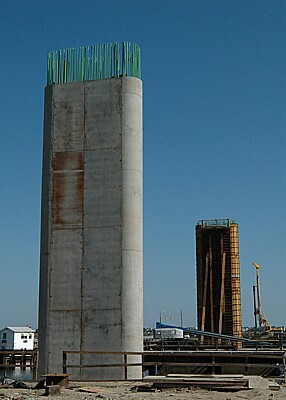 The work bridge and a drill shaft partically indicate the lowness of new bridge on the causeway end. 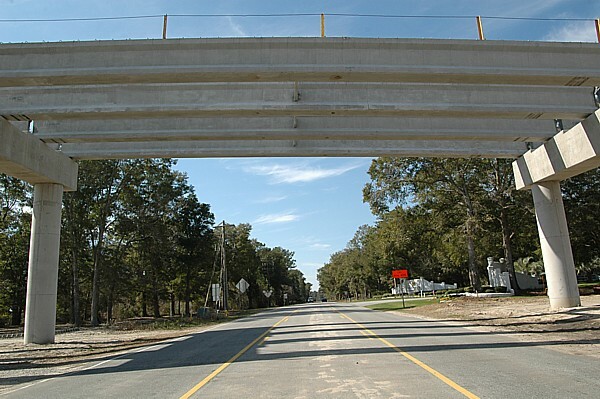 Although the bottom of the bridge will be that low on the island, the part of the bridge on which people will be driving will actually be much higher than the ground at that location. 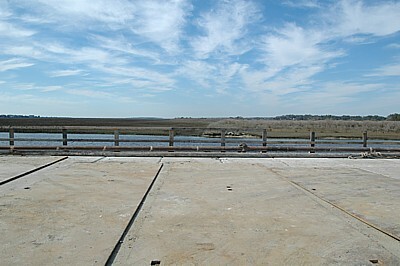 This is most of the mainland side of the new Sunset Beach Bridge. 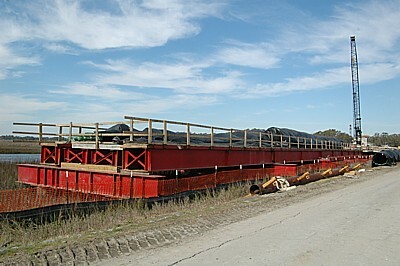 The base of the deck is in place. 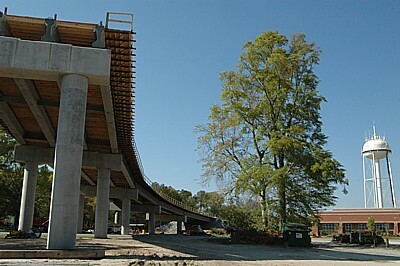 The brown wooden forms will support the concrete decks. 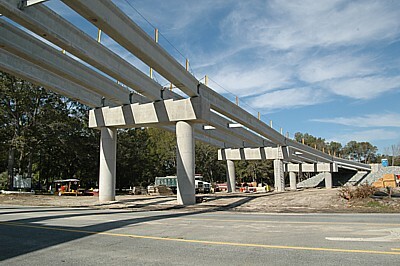 The concrete decks will have steel rebars reinforcing them and then be poured with concrete to create the riding suface on which cars will ride. 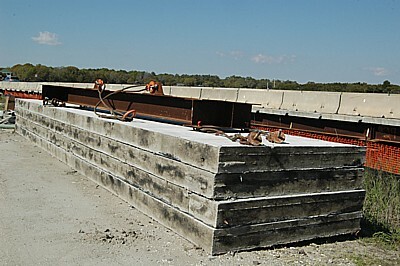 After the concrete decks cure, the wooden forms will be removed. This is very labor intensive.